I know alot of you out there are really into high quality amazingly cool vectors. So my good friend Ben over at BenBlogged has launched an amazing new section with some really cool vectors. They are really affordable and could be used for lots of different uses. If you like my vectors, or GoMedia, then you should check out BenBlogged Premium Vectors. Well it has been almost 7 months since my first free vector pack on Vecteezy and I am AMAZED at the results. In six months, I have had over 150,000 downloads! It is truly an honor to have been downloaded that many times! I have had such a great experience with Vecteezy and I engourage you all to go and check it out, because there are SO many talented designers posting on there and the qulaity of work is amazing. As promised, I have launched my new site. Go check it out at http://www.nenodesign.com. It is based off of an amazing tutorial over at nettuts.com. Collis did a great job, and I can’t wait to see what he brings us next! Also, like I promised I will be releazing some fun new vectors for free soon. 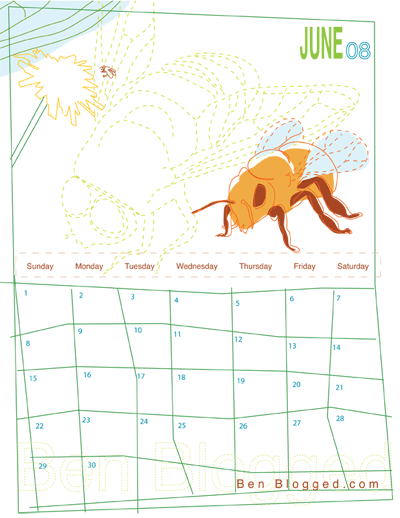 Last months pdf calendar didn’t come through, but this months, we have a very good artist and blogger that many of you may be familiar with…Ben Blogged. Ben runs a website called benblogged.com, and he has some really great resources that are very useful and clean. I have always respected Ben and his work, it has inspired me from the early stages of my journey into design. I hope you all enjoy the calendar and check out benblogged.com for some really great info. So today I was lucky enough to get posted up on AiBURN’s resource section. That to me is a huge deal. Those of you not familiar with AiBURN should check it out because Sean Hodge has done an amazing job of amassing numerous tutorials, resources, and insight into the world of design. I have looked at AiBURN as a invaluable resource for sometime now. And even if you consider yourself a pro, I bet you can go to AiBURN and learn some great things. So go check them out. Hey, I know that you all are probably enjoying my free vectors, but you should spend some time away looking for inspiration (and free vectors). Go Media is another awesome Mid-West design agency, located in Cleveland, OH. They hold it down quite well and look for more from them and me in this blog in the future.